This page describes the elements of the UML that I expect my students to know. By no means does this document attempt to portray all of the UML. Those elements described herein are those that I have found useful in practice and those that I have seen featured in formal and informal written communication. That is, these are the minimum features that I consider to represent UML literacy. This document is being written in Fall 2011, and we already talked about these in class. I'm not going to invest the time in reiterating the same content here, since you have it in your notes already. This can be represented with the following class diagram. The fields and methods are annotated to indicate their access level: plus (+) for public, minus (-) for private, and hash (#) for protected. UML conventially uses Algol-style naming, so variables are given as name:type and methods are given as name(params):type, where each parameter is, of course, a variable. In UML, metadata is often represented through stereotypes, which are always listed in guillemet. For example, the fact that our Example() method is a constructor is identified via the «constructor» stereotype. Static members in class diagrams are underlined, and abstract elements are italicized. Here is another code and diagram example. Interfaces are given the «interface» annotation, as shown below. Keep in mind that UML is a communication tool, and you can omit details that are not necessary for expressing your message. For example, I frequently skip the middle box in UML classes since they deal with data representation, and I'm usually more interested in capturing the relationships among classes. It is the messages sent among objects that give a system dynamic behavior, and these are represented in UML through the relationships among classes. There are four kinds of relationships that I use regularly, shown in the following table in order of increasing specificity. That is, the relationships lower on the table subsume all those above them. This is a very loose relationship and so I rarely use it, but it's good to recognize and be able to read it. Associations imply a direct communication path. In programming terms, it means instances of A can call methods of instances of B, for example, if a B is passed to a method of an A. This is a part-to-whole relationship, where A is the whole and B is the part. In code, this essentially implies A has fields of type B. That is, A aggregates B, and if the A is destroyed, its B are destroyed as well. Two other important relationships deal with the relationship among classes, shown in the table below. Equivalently, B is a subclass of A. In Java, this is extends. As the parenthetical name implies, this is used to show that a class realizes an interface. 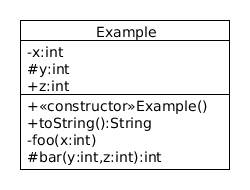 In Java, this is implements, and so it would be common for A to have the «interface» stereotype. Note that it's not mandatory to draw these with vertical alignment, but I do recommend it to improve readability. Most readers will conceptualize the upper class as more general and the lower class as more specific; if you were to invert your relationship, you would be causing unnecessary cognitive dissonance. If what you're trying to express is that information gets to SomethingSpecific from Button, then you can use the ball-and-socket notation instead, as shown below. This says that the communication between Button and SomethingSpecific happens through the ActionListener interface. On the other hand, if the important thing to show is that this is a reification of the observer design pattern, then you can use a UML collaboration to show this. As always, it all comes down to knowing what you want to say and then using the notation to your advantage. You can put a note on any part of a UML diagram. Connect the note to the relevant bit with a dashed line, as shown in the example below. The UML is a massive specification, and I've only showed one or two kinds of diagrams above. These are the diagrams I encounter most often in research, on the Web, and in print. For your next steps, I would recommend learning state machine diagrams, activity diagrams, and use case diagrams. One of the most useful UML resources I have found online is Allen Holub's UML Quick Reference—great for getting a refresher or a birds-eye view on a diagram type. All of the diagrams above were created with UMLet, an amazing and free tool for rapidly creation of UML diagrams. All the UML you need to know by Paul Gestwicki is licensed under a Creative Commons Attribution-NonCommercial-ShareAlike 3.0 Unported License.